DUKE (US)—In a novel study that used historical tape of a thrilling overtime basketball game between Duke and the University of North Carolina at Chapel Hill, brain researchers have found that fans remember the good things their team did much better than the bad. It’s serious science, aimed at understanding the links between emotion and memory that might affect post-traumatic stress disorder and how well people recall their personal histories. The findings were reported Feb. 10 in the Journal of Neuroscience. 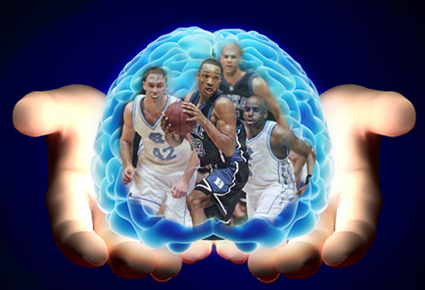 Struggling to find a way to measure a person’s brain while subjecting them to powerful emotions, Duke University scientists hit on the idea of using basketball fans who live and die with each three-pointer. Using game film gives researchers a way to see the brain deal with powerful, rapid-fire positive and negative emotions, without creating any ethical concerns. “You can get much more emotional intensity with a basketball film than you could ethically otherwise,” says study coauthor David Rubin, the Juanita M. Kreps Professor of Psychology and Neuroscience. Similar studies, for example, might use pictures of flowers versus mutilated bodies. Two dozen college-aged men from both Duke and UNC who had passed a basketball literacy test to determine their true fandom were shown an edited tape of the Feb. 3, 2000 game at UNC’s Dean Smith Center, which Duke won 90-86 in overtime. They watched the full game three times with a few like-minded friends, and then went into an MRI machine individually to watch a series of 12-second clips leading up to a shot. Each of the 64 taped segments ends just as a player releases the shot, and the subjects had to answer whether it went in the basket or not. Test subjects were more accurate at remembering a successful shot by their own team than a miss by their team or a successful shot by the other team. Positive emotion improved their memory and “broadened their attention,” according to neuroscientist Kevin LaBar, who coauthored the study. What the researchers saw in the MRI scan is multiple areas of the brain being recruited to assemble a memory. The fan’s connection to the game includes an emotional component from the amygdala, a memory component from the hippocampus, and some empathy from the pre-frontal cortex as the subject feels some relation to the player or to the other fans on his side, LaBar says. Some of the sensory-motor areas light up, too, as if the subject is imagining himself as the shooter. Brain areas that control attention were more active for plays that benefitted the fan’s team than for those that did not. 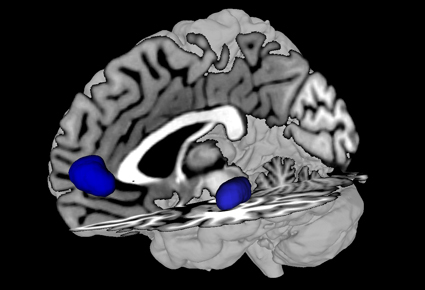 These brain regions function together to improve memory storage, particularly for emotionally intense plays, explains LaBar, who is an associate professor of psychology and neuroscience.